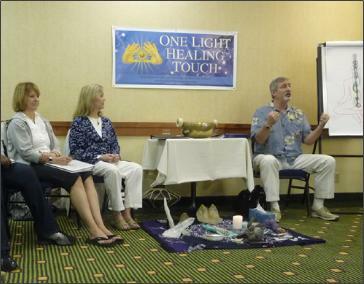 ONE LIGHT HEALING TOUCH was founded in 1996, by Ron Lavin, MA, a renowned healer and gifted psychic. ONE LIGHT HEALING TOUCH is an acclaimed International Energy Healing and Mystery School and offers Basic, Masters and Teacher-Training Programs. THE BASIC TRAINING is a 14 to 18-day School, presented over four to six months. It teaches over 50 Shamanic, Holistic, Spiritual and Esoteric Self-Healing Practices and 33 advanced Energy Healing Techniques for healing oneself and others. It offers innovative and liberating trainings that enhance our abilities to know, express and fulfill ourselves and to help others grow and evolve. The Training includes a range of unique, transformational techniques that help us to release long-held programming and subconscious energy patterns that allow for profound change to occur. The OLHT practices and techniques increase our: health, awareness, joy, creativity, intuition and other psychic abilities, deepen our spiritual connection, and helps us to fulfill our Purpose for Being. Our School honors all spiritual traditions, serves the novice and advanced practitioner alike, and awards a Certificate in Energy Healing. READ MORE. MASTERS STUDENTS learn an additional 22 “Master-Healer” Energy Techniques and Practices. See Basic and Masters Courses for details. Ron Lavin is currently on hiatus until June 30. If you would like an in-person or distant healing energy healing session, see our list of: Certified Energy Healing Practitioners. Our graduates are highly trained in using advanced energy techniques for treating a range of chronic and acute conditions. Ron has participated in five landmark studies with the National Institutes of Health (NIH) and has been featured in the media internationally, including the Telly-winning documentary, THE HEALING FIELD – Exploring Energy & Consciousness, which is available on Amazon, Gaia.com, Beyondword.com, and Penny Price Media. 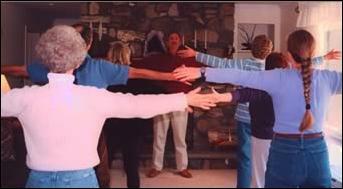 The ONE LIGHT HEALING TOUCH Schools are located in in the US and throughout Germany. See Calendar-Locations for all listings. Schools, Workshops and Talks in Your Area. See Products: ONE LIGHT HEALING TOUCH Journeys. Join Ron Lavin in the self-healing practice of Running Energy™.